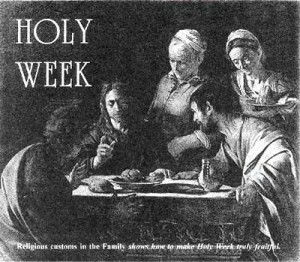 The last three days of Holy Week have always been a time of special observance in the society of st pius x beliefs. They are a period of quiet, recollection and prayer. In many places, even today, people lay aside their usual occupations in order to have ample time for prayer, meditation and attendance at church services. Children stop all noisy games and amusements. No music instruments are played; radio and television are not used, except for appropriate religious programs; no comics are read, and all members of the family fast a little more than during the rest of Lent. This atmosphere of penitential devotion and quiet during the three great days of Holy Week is an experience that deeply affects the children and helps them more than any words could do toward an understanding of how important Christ’s Passion is for each one of us. It also induces them to meditate, mourn and pray with all sincerity. Thus, the grace of God is poured into their hearts and great supernatural blessings are given them in these days. This is the traditional day far a very devout and fruitful Easter Communion. If at all possible, it should be received by the whole family together. Here the ideal is supported by a certain pressure of necessity, thank God. Since there is only one Mass on Holy Thursday in most parish churches, the members of a family going to Communion will have to receive at the same time. So, why not take one more step and go willingly, consciously, as a family unit of parents and children together? In many homes, the memory of the Last Supper is brought out by the arrangement of the main meal in the evening. Of late the custom has been suggested in various books and pamphlets, of imitating the ancient Passover meal, even in its details: A yearling lamb is to be roasted gad served with bitter herbs and a brown sauce; Jewish matzos, together with wine, are to be distributed by the father in silence to all members of the family, thus commemorating the institution of the Blessed Sacrament. The use of some pious “ritual” at the super on Holy Thursday is surely to be recommended. however, an imitation of the Last Supper of Our Lord in its details does not seem to be advisable. Children, with their gift of keen and faithful observation, might easily conceive the ritual at the family table as a “photographic” reproduction of the “Last Supper and thus acquire inaccurate and unhistorical notions about it. To mention only one example are we sure that Christ used massah (unleavened bread) of the shape and size of modern Jewish “matzos”? Starting on Holy Thursday, a little family devotion might be held with those children who are too small to go to church for the services. On each of the three days the events commemorated could be explained to them and a few prayers said with them before the family shrine. Good Friday was always observed in the Church as a day of mourning, fasting and prayer. Since the Reformation. however, some sects have tried to bestow upon it a joyful note. This practice certainly does not represent the spirit of early Christianity. The Apostolic Constitutions (fourth century) call Good Friday a “day of mourning, not a day of festive joy,’ and St. Ambrose (c. 340-397). Archbishop of Milan, termed it a “day of bitterness on which we fast.” (Sancti Ambrosii Epistolae, Patrologia Latina, vol. III, col. 12). The note of sadness. mourning and prayer is expressed in all the solemn and beautiful rites of the Good Friday liturgy. Now that this liturgy has been restored to its ancient form, the faithful array also receive Holy Communion on this day. It is an old custom among Catholic populations that on Good Friday parents and children are especially recollected and quiet all through the day. Even the meals are taken in silence in many homes. Children do not go out to play with their friends, but walk to church instead, to pray the Stations. There is no doubt that such pious observance places a certain train on the youngsters. They are willing, however, to carry this burden if the parents prudently inspire and encourage them. Only children who sincerely and willingly perform some of these penances will taste the fullest measure of a glorious and overflowing Easter joy. A very appropriate and helpful occupation for children on Good Friday would be the slow, meditative study of good reproductions of classical religious art, showing scenes from the life, the Passion and the death of Our Lord. It will not be too difficult for the average family to buy and collect such picture albums of the great masters. We have excellent and inexpensive editions of religious art reproductions. These could be kept in the home as visual education aids for parents and children, both for spiritual meditation and for the appreciation of good art. Since the anticipated vigil service on Holy Saturday morning was abolished by Pope Pius XII and its liturgical celebration again placed in the evening hours, or during the night, the spirit of the whole day has returned to its original significance. It commemorates Christ’s rest in the tomb. No services are held in the churches all through the daylight hours. It is only at night that the Easter starts, with its deeply impressive ceremonies. It is a night of prayer and joyful expectation, until finally the Alleluia proclaims the exultant message of the Resurrection and leads us to the glorious celebration of Easter in the Holy Sacrifice. In the home, the spirit of Holy Saturday should still be one of devout recollection, but a note of relief and peace will replace the sadness of Good Friday. Parents and children could busy themselves with various preparations for the feast, refraining, however, from premature celebration. The fancily shrine might be rearranged and decorated with special solemnity for the Easter season. We should like to appeal to Catholic parents that they allow their children of school age to attend the Easter vigil service in church. In many places this service is held in the evening of Holy Saturday and thus presents no great difficulty for the attendance of smaller children. Those who cannot easily follow the sacred rite by reading the booklets might have the meaning briefly explained by the parents.